Aikatsu Stars! – 005 | Mezashite! Finally the last week of the Go Go Start Campaign. You don’t want to know how long I had to spend researching this history and etymology of hotpants and short shorts. But that’s really what fansubbing is all about. Let me know if you agree that this week’s performance was far superior to all the ones so far this series. By the way… is it just me, or does it sound like Kokone is providing voices for squirrel puppets now? Thanks for all the hard work, I love seeing Aikatsu Stars being subbed as well. As a general piece of feedback, I found the lyrics to the new song REALLY hard to read, and I like to read along to them, especially since you put so much work into them. The choreography was definitely improved, and the song was great, but the facial expressions are still stiff and wooden compared to the original Aikatsu. I realize the early CG in the original was also primitive, but we’re now years past that in terms of both tech and staff experience, and the later days of Aikatsu showed that plainly. With Stars so far, it definitely feels like we’ve taken a very large step back. IIRC the animations are all now being done in-house, so it is to be expected that they wouldn’t be as good as the external team that was doing it before. 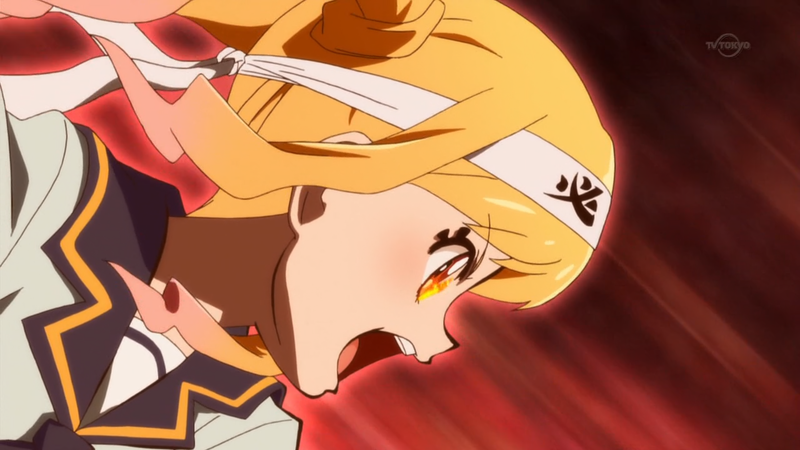 Now this is atsui, MOETEKITAAAAAAAAAAAAAAAAAAAAAAAAAA!!!!!!!!!!!!!!!!!!!!!!!!!!!!!!!!!! !